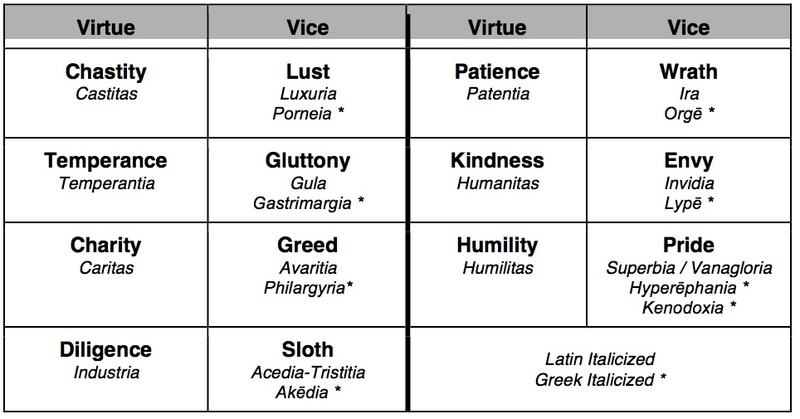 How many reading this have heard of the Seven Deadly Sins and the Seven Heavenly Virtues? Look at the vices and the virtues in the list above and read what they are. Ask yourself, which do we see most of today and which would you prefer to see? More important, which list fits your life most? If we’re honest, we’ll probably have a mix from both with some vices or virtues being stronger or weaker than others. After all, we are human and if we didn’t have a mixture then we would have no need for being here any longer. We’d have learnt all we needed to and would be – hopefully – in Paradise. How many people veer more to the side of the list of vices now though? So much anger and greed in the world, with so many people thinking the world is all about them with no care or thought for others. We live in a very strange world today where badness, defying authority, self-absorption, greed and materialism are on the increase. How many people still talk of sins? Have you ever used the word or thought it about yourself? Do you hear others use it or believe they commit any? We are all guilty of sinning, whether anyone wants to pretend they are or not. Sins are based on the seven vices seen above and anything that relates to them in any way. We need to look to ourselves and see which we are guilty of and try hard to work on them. Everyone is quick to judge others and condemn, but how many judge their own behaviour; recognising their own failings that need to be improved and changed? It is never too late, so why not start today? It takes hard work, diligence and honesty about who and what we are and do. Changes won’t happen overnight and all the good virtues will need to be worked on every day of our lives. If we were prepared to do it, imagine the difference we could make to those around us and to our own lives. If everyone did it, imagine the difference it would make to the world. Lead by example. Stand up and make your voice heard. Have the strength to speak out against all we see that is bad in the world. Help change what can be changed and walk away from that which can’t. Be that guiding light so many are seeking for today and help God to make the world He gave us the place He hoped it would one day be.